Today is the last day of summer. Today is also the last Sunday of my life as a single lady! I just can't believe how time went by so so quickly but, it actually is happening, we're getting married next Sunday! This coming week our wedding preparations are peaking plus we're throwing a pre-wedding party for our friends on Wednesday. On top of that, this week we're also having our second trimester ultrasound to see our little baby. I just can’t be more excited for this week to come! And the next one too, for we’re leaving for a petite honeymoon (of only a week) to the southern of Crete. Sun, sea and relaxation will be the only to-dos on my list these days. Oh, I can't wait..
Photo by Jose Villa via Elizabeth Anne Designs. 19 comments on "Wedding break"
Have a very great time, Eleni! Να φτιάξετε τις πιο όμορφες αναμνήσεις στις ερχόμενεες 2 εβδομάδες! Να ζήσετε!!! Big big congrats! I hope you have a great day and also a lovely week of preparations! 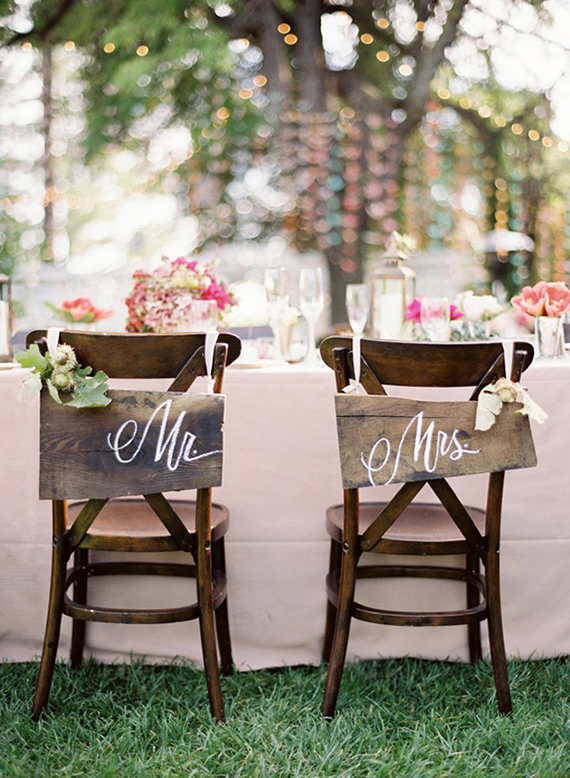 I love the rustic wood signs on the backs of the chairs! Did you make them yourselves or did you get them from some kind of party rentals and wedding rentals? να ζησετε και εμ το καλο το μωρακι!!!! I wish you all the happyness you have been providing us with your beautiful blog! How sweet ^^ Thank you so much! It's truly wonderful to read this post and feel your excitement, I hope this carried on into 2015!